Today is my godson’s name day! I can’t bake cookies with him today, or read books with him. He lives too far away. But I’ve dispatched presents to him. I’ve prayed for him. And I’ve read the life of his patron, Theodore the Studite. I suspect that St. Theodore was a stubborn and difficult child from his earliest days. I don’t know that for sure, of course. But he was, in his latter days, stubborn and unbending. He couldn’t be made to do anything. Not with torture. Not with exile. Not with threat of death. Let’s start at the beginning. Theodore was born in Constantinople in the year 759. He was the firstborn son of wealthy and powerful family. His father, Photeinos, worked for the emperor, managing the imperial finances. His mother’s brother, Platon, had also worked for the emperor, but the year Theodore was born, Platon left public service and joined a monastery. When Theodore was 22 years old, his uncle Platon persuaded him, his parents, and his siblings to take up monastic life as well. They transformed their family estate into a religious foundation, the Sakkudion Monastery. Platon was the abbot of the monastery. His nephew Theodore served with him, learned from him, and took over from him in 794, when Platon retired to a life of silence. It was in 794 that Theodore made imperial enemies. The emperor’s wife hadn’t produced an heir, so the emperor divorced her and married one of her handmaidens. Unfortunately for the emperor, barrenness wasn’t grounds for divorce, and Theodore demanded that the priest who performed the marriage be excommunicated. That might have been okay, but he also demanded that everyone who had received communion from that priest be excommunicated as well. Which would involve excommunicating the emperor. That wasn’t going to happen. But the emperor was willing to overlook the insult and to make nice with Theodore and his uncle. They weren’t willing to make nice with the emperor. When Theodore and Platon ignored an imperial invitation, the emperor sent troops to the Sakkudion Monastery, dispersed the monks, arrested Platon, and flogged then banished Theodore to Thessaloniki with ten of his brother monks. It wasn’t long before that emperor was deposed. Irene became empress, and she called Theodore back from exile. That ended his first exile, but it wasn’t his last. As emperors came and went, so did Theodore. Exiling Theodore may have gotten him out of the way, but it didn’t shut him up. While he was in exile, Theodore wrote letters, hymns, poems, sermons, and catechisms. It seems likely that all of these writings made him more influential, and his ideas more powerful, than they would have been had the emperors ignored him. He’s also known as the dear friend of St. Kassiani, who (among other things) wrote a hymn that we sing every year during Holy Week. He is not well known as one of the church’s earliest opponents of slavery, although he should be. He forbade anyone under his authority to own a slave for any reason, because man is made in the image of God. St. Theodore has been a source of miraculous help to many people over the centuries. In particular, people call on him for deliverance from fires and for healing from stomach ailments. And I think perhaps parents of stubborn children should ask his prayers. Stubbornness can be a gift. It can even help you become a saint. But raising a stubborn child is hard. 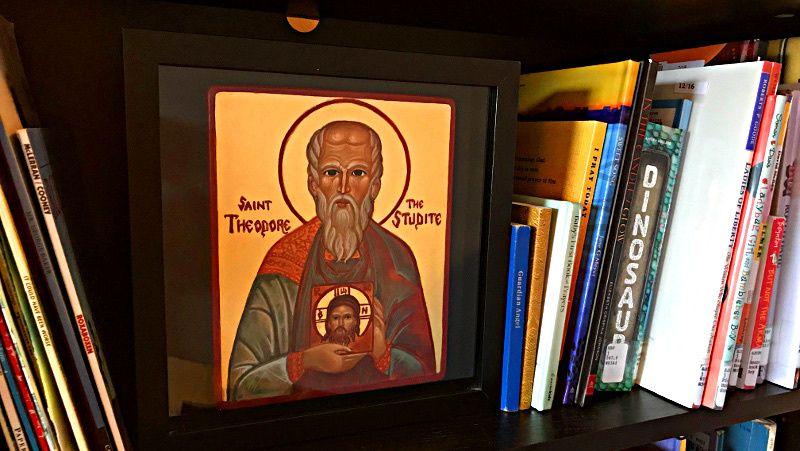 We had Randi Sider-Rose create the icon of St. Theodore the Studite. 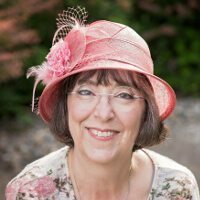 You can learn more about custom commissions on her website, Immanuel Icons. You are a guide of Orthodoxy, a teacher of piety and modesty, a luminary of the world, the God inspired pride of monastics. O wise Theodore, you have enlightened everyone by your teachings. You are the harp of the Spirit. Intercede to Christ our God for the salvation of our souls. Venerable Vitalis, Patron of Prostitutes: St. Vitalis is another saint who didn’t care much what anyone said about him. St. Stylianos, Guardian of Children: St. Stylianos was a hermit who, more than 1500 years ago, ran a daycare center. St. John the Almsgiver: The day after St. Theodore’s feastday is the feastday of St. John the Almsgiver.